It's a special cooking demo & tasting, just for adults! 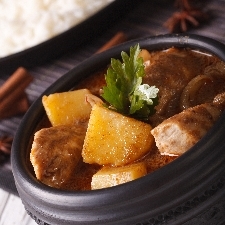 Natty Netsuwan of ThaiTable.com will demonstrate how to make Massaman curry paste, a chicken curry, and a delicious dessert! Get a taste of authentic Thai cooking--and learn how you can easily recreate the flavors at home--during a delicious cooking demonstration by Thai cook Natty Netsuwan! Bring your friends, your curiosity, and your questions. Chef Natty promises to reveal everything you want to know about Thai food, but were afraid to ask! No reservations are needed for this program, but space is limited. Natty Netsuwan grew up in Thailand to a family that loves eating well and cooking from scratch. Natty went on to create the website ThaiTable.com, which for over 15 years has been the most popular Thai food website. Focusing on the breadth of "Thai food that Thai people love in Thailand," Natty has taught millions of people worldwide how to make authentic, great-tasting food. Natty also teaches in private homes and at events. This free event is made possible by contributions to the Friends of the Menlo Park Library, and thanks to Chef Natty's generosity.